Good morning folks! I’m so excited to be posting here every week and just I just have so many recipes, and news and travel and sustainability hacks to share that I’m positively bursting at the seams! This week I wanted to tell you guys a bit about the collaboration I launched last week with the awesome Kerala Kitchen on Baggot St in Dublin. 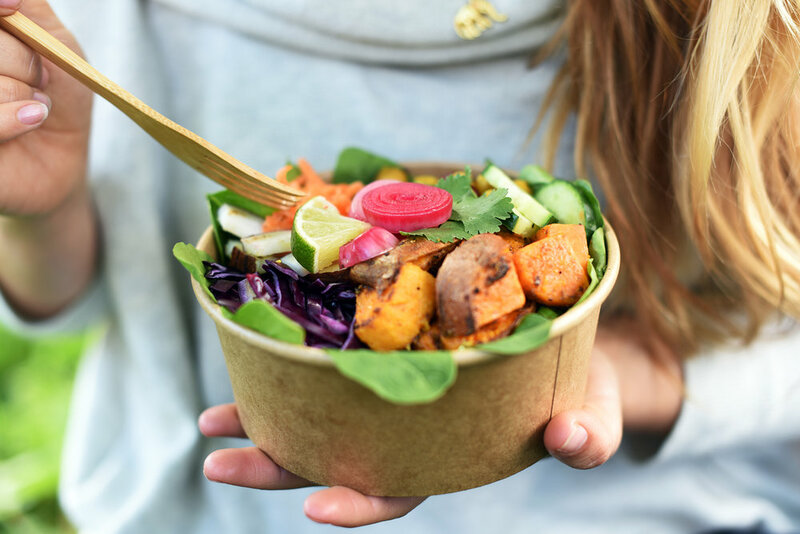 Introducing the Chakra Buddha Bowl! I’ve long been touting Indian cuisine as the unsung hero of both the healthy and the gluten free foodie spheres ( I rave about it a bit in my cookbook Finn’s World) and so I was totally stoked to create a summer recipe for KK’s menu. When eating out, even if the whole menu isnt gluten free I find indian cuisine one of the safest as its based on freshly made sauces, thickened without wheat and the carbs are based around rice and chickpea flour. In some places the only thing I cant eat is the naan! I’ve had so many friends shy away from an indian meal on a weekday as theyre worried about the heavy cream of a korma. Simply chatting to the staff about what you're looking for can lead not only to new and delicious flavours but also a meal thats a perfect balance of fresh veg, slow release carbs and lean protein and full of antioxidants and anti-inflammatories from the blend of herbs and spices! Playing with all our fresh ingredients to put the perfect elements together. While we sometimes think of an indian takeout as a “cheeky” weekend treat we also forget that India is the motherland of Aruveyda - which promotes optimum health through diet and the use of natural herbal compounds. So with that in mind we were inspired to create a delicious dish incorperating traditional herbs and spices and to put our own spin on it to create the Chakra Buddha Bowl. The idea behind the bowl was something that was light and summery but also gave you a delicious substantial meal. I adore buddha bowls because they're bursting with colour and so many fresh and raw ingredients. 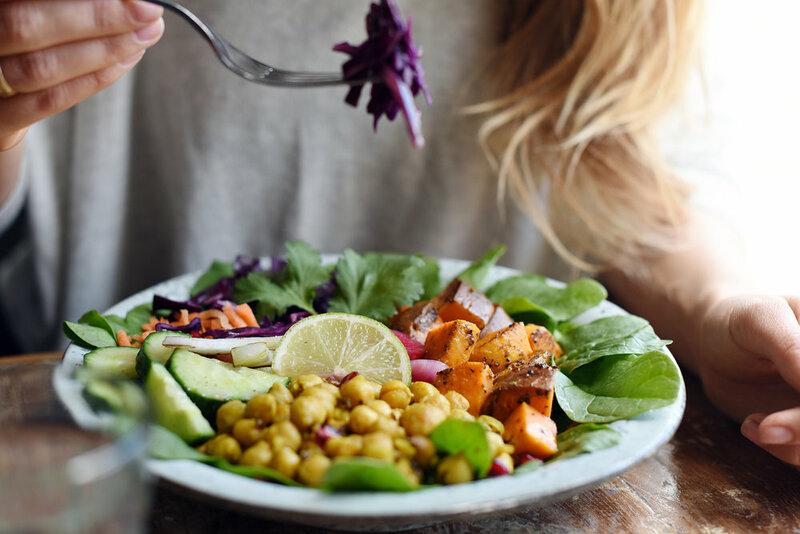 In ours you get some high quality carbs - in the sweet potato - to keen you going all afternoon, as well as plenty of protein in the chickpeas and leafy greens. It was so amazing to work with Chef Bhupal of Kerala Kitchen to create our Chakra Buddha Bowl! The Chakra Buddha Bowl is chock full of some of my favourite body-loving ingredients such as - fermented foods - pickled red onion and cucumber, fresh raw ingredients - pomegranate, lime, coriander and red cabbage and immune system loving - turmeric, cumin, coriander and chilli. The dish is made heartier and veggie friendly with chickpeas tossed in spices and lime juice and marinated sweet potato pieces. The bowl is finished with Kerala Kitchens signature special dressing. The Chakra Buddha Bowl will be available in Kerala Kitchen from the 1st of June and will be available for the summer! To learn more about Kerala Kitchen and to peruse their mouthwatering menu head to www.keralakitchen.ie and for a sneak peak of their dishes check them out on insta at @keralakitchen !